MIPs Open Day - Saturday 4th June. 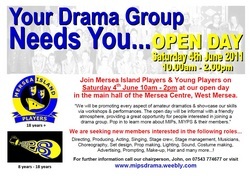 Your drama group NEEDS YOU...! MIPs Open Day - Saturday 4th June 10.00am - 2.00pm. Main Hall, Mersea Centre, West Mersea. 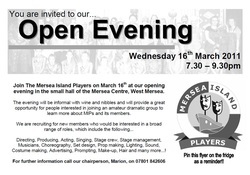 MIPs Open Evening - Wednesday 16th March 7.30 - 9.30pm. Small Hall, Mersea Centre, West Mersea. New photos added to the site from our latest production "Sandcastles"